The 100th birthday of artist Toko Shinoda in March was celebrated in many cities. The Portland Japanese Gardens offered the public a retrospective of her work, and Azuma Gallery here in Seattle has Shinoda’s work on display through this weekend. Shinoda is a master of the abstract with a distinct approach informed by a century of living with drive to create beauty for its own sake. Shinoda’s influences and inspirations include jazz and Abstract Expressionism, which itself holds DNA from traditional Japanese painting and printing. 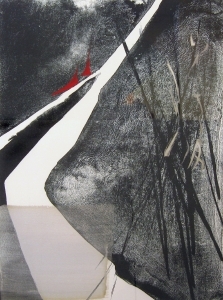 Her use of lithography allows her to paint directly onto the stones that generate her prints of sumi ink, which she uses for its “infinite spectrum.” That spectrum is used sparingly in any one print, which is mostly black and white and only accented by one or two colors. To analyze the works for some thematic or critical content is futile. Shinoda herself emphasizes there is no content there. This will cause some critics and artists to balk at work so uncynical that it embraces beauty for its own sake. This is true of much traditional art in Japan, especially that made prior to the war. Shinoda’s aesthetic is thus both a point in a cyclical exchange and also direct link to a purely aesthetic, almost animistic approach to art. Yet, it does not tell, but rather shows with great sophistication—healing tranquility, energizing rhythm, mindful simplicity. Several pieces combine gestures of immovable austerity overlaid with a playful rhythm that can only be achieved when you have seen to the heart of both. Indeed, the white space itself in the images is part of the image. In Japanese, yohaku is the word for this negative space, and in a culture whose experience of beauty (and all being) is tied to ephemerality and non-being, this negative space is not void but an active part of the composition. At this particular show, there is one matter that I hesitate to bring up simply because it seems so niggling, but as I have two perspectives on it, I will address it. 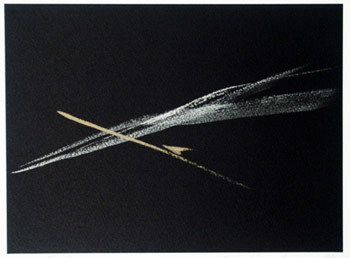 A very small minority of the prints have been presented in black matte and boxed in lacquer. The gloss and compartmentalized pieces absolutely take away from the work of the artist. One could call the more ornate forms a sculptural element, and certainly in the right settings they could make a bold impression, but to my eye the effect is jarring. It takes the perfected delicacy and slathers it in artifice. One successful example of presentation is mounted floating over a deep indigo matte, but many of these could be enjoyed in the most minimal of frames. However, I myself must offer a counterpoint: The glossy frames might resemble grand bento boxes and serving platters, and when this occurred to me I had a laugh and began to enjoy them. Was I seeing a beautiful dish that Shinoda enjoyed, sublimated from its ephemeral state into a lasting visual statement? Perhaps. What is certain is that the retrospective of works is a feast for the eyes and you should try to see it Azuma Gallery before it disappears. 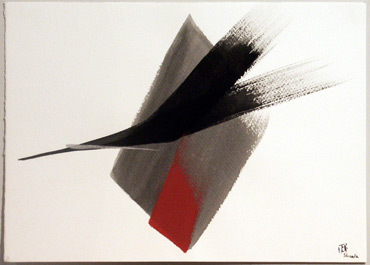 Toko Shinoda’s works are on display at Azuma Gallery through April 27.